Can’t make up your mind whether to get a recreational kayak or a touring kayak? Don’t worry, many kayakers also find themselves with the same dilemma as they get caught in the middle of the recreational vs. touring kayak argument. To help you with the choosing process, we listed the different factors that you should consider when shopping for a kayak. We also highlighted which of the two types of kayak excel in those areas so you can make a more informed buying decision. Touring kayaks are longer than a recreational kayak by a couple of feet. This extra length gives you more room to store your gear or any other item that you may need for an extended kayaking adventure or an overnight kayak camping trip. Touring kayaks mostly have hatches and sealed bulkheads which keep your equipment dry and also limits the amount of water the kayak will take on if it capsizes. Stability is the kayak’s ability to resist tipping over or capsizing under normal water and wind conditions. In general, recreational kayaks are wider than touring kayaks by several inches which then makes them more stable than touring kayaks. That said, recreational kayaks are usually the recommended kayak for beginners since touring kayaks may feel tippy or wobbly for them. For many kayakers, speed is an important consideration when it comes to choosing a kayak. Although speed is predominantly determined by the kayaker’s paddling ability, style, and technique, the type and design of the kayak can play an important role, too. And between the two kayaks in question and all else being equal, touring kayaks tend to be faster on the water. The reason as to why this is so is because of the touring kayak’s narrow design profile. As mentioned earlier, recreational kayaks are wider by several inches than a touring kayak. This extra width means that recreational kayaks won’t be able to efficiently slice through the water, especially against strong currents and heavy winds. In addition, the extra width also causes more drag which negatively affects the kayakers’ paddling effectiveness and, consequently, their speed. Tracking refers to a kayak’s ability to travel in a straight line. If a kayak continues to move forward smoothly over the water even after you stop paddling, then it is said to have good tracking capabilities. Between recreational kayaks and touring kayaks, the latter has often been observed to have better tracking capabilities due to its longer length. This is one reason why touring kayaks are the preferred options for kayakers who are planning an extended kayaking adventure. Because touring kayaks have better tracking capabilities, they can travel longer distances without requiring so much effort from the paddler. 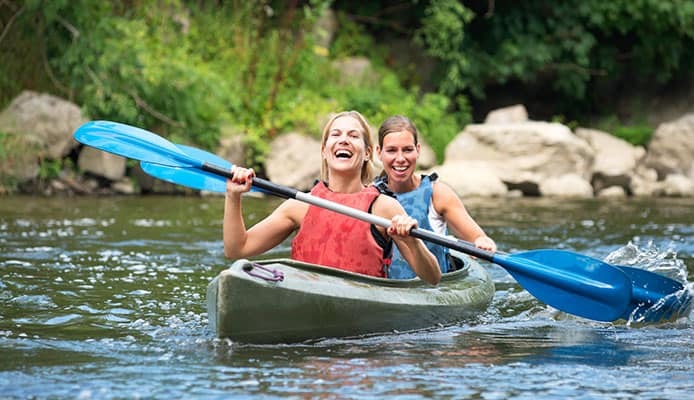 Maneuverability refers to how easy it is to turn or maneuver the kayak. Being a couple of feet shorter, recreational kayaks are more maneuverable than touring kayaks. The extra length of touring kayaks significantly affects their handling. And the longer the touring kayak, the more difficult it is to turn. In order to make touring kayaks more maneuverable, manufacturers design them with rudders (a blade attached to the stern which pivots from side to side) which are controlled by foot pedals located under the deck. Stepping on the left pedal turns the kayak towards the left and stepping on the right pedal turns the kayak towards the right. Between recreational kayaks and touring kayaks, the latter tends to be more expensive than the former. One reason for this is the material used in the construction of the kayak. 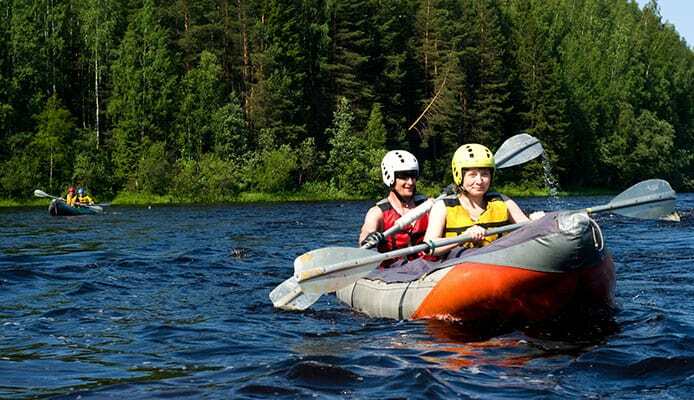 Recreational kayaks are constructed from polyethylene which is less expensive compared to carbon fiber or other similarly lightweight materials which are used in making touring kayaks. The features (i.e. skegs, rudders, etc.) incorporated in a touring kayak’s design is another reason why it’s more expensive than a recreational kayak. You’re a new paddler who isn’t comfortable with a rocky ride or nervous about tipping over. You’re mostly planning to fish or take photographs from the boat and don’t want it rocking as you fumble around with your equipment. You’re not sure how deep you want to engage in the sport and aren’t ready (or don’t want) to spend a ton of cash for a kayak. You’re the type of paddler who likes kayaking in lakes, slow moving rivers and streams, and relatively calm waters. You are more concerned about comfort while paddling (the larger and wider cockpit and kayak will give you more room and will feel less restricting). You’re a serious kayaker who wants to paddle faster and farther. You’re looking for a kayak that is designed to track well in fast currents and increase lift in rough water so it doesn’t get swamped by a wave. You’re okay with sacrificing stability for speed. You’re looking for a kayak with more than sufficient storage space for your gears or (whatever you need to bring while kayaking). You’re hooked into the sport and ready to invest a significant amount for a kayak. When it comes to the recreational vs. touring kayak debate, remember that both types of kayaks are designed differently and are suitable for different paddling conditions and situations. Whether you choose a recreational kayak or a touring kayak, what’s important is that you choose one that best meets your personal preference and needs.